Steve Noyes, Met Office operations and customer services director, said: “Nobody knows Britain’s weather better and, during our long relationship with the BBC, we’ve revolutionised weather communication to make it an integral part of British daily life. 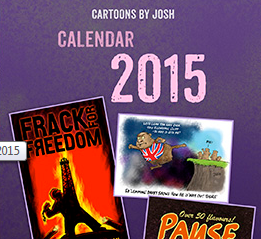 Is Piers Corbyn taking over? The cold air reaches to the eastern US and the UK. This year the Met Office has been pretty accurate with their 2 day shipping forecast. Much more so than XCWeather which is the other one I use. Beyond two days though you might as well toss a coin. Having regard to the Treaty on the Functioning of the European Union, and in particular Article 53(1), Article 62 and Article 114 thereof, we have DIRECTIVE 2014/24/EU. Hoisted and Petard come to mind. Don’t you just love irony. Probably means that the Met Office dont have people coming up through the ranks who are prepared to keep the ‘Warming’ meme going ? Only one facet is being mentioned, price. What else is in the specification being demanded? To overcome the likely effects of this earth-shattering disaster, just take the Met Office advice – go to their website and get the UK forecast from the horse’s mouth. I wonder which one of the BBQ summers was the straw that broke the camels back. It does seem a bit odd that the BBC is dumping the Met Office, given they’re both wedded to the man-made global warming fiction. Some of its long-range forecasts were embarrassing though. ‘The Met Office stopped publishing its long-range forecasts for the public to see in 2010, after its disastrous prediction of a ‘barbeque summer’ in 2009 – which ended in washouts throughout July and August. Hi to all you statisticians out there. The met office quotes accuracy better than 90 % on temperature forecasts to within 2 deg but uses ETS scores for precipitation. Their target is ETS of 0.5 The only way to know if this is good or bad seems to be to compare the accuracy of other forecasting organisations, but searching websites I can’t find any other organisation that seems to use this. Does anyone know if 0.5 is good or bad? Why don’t they use the same scoring system for temp and rainfall, is it because they are so bad at rainfall prediction they want to obfuscate? 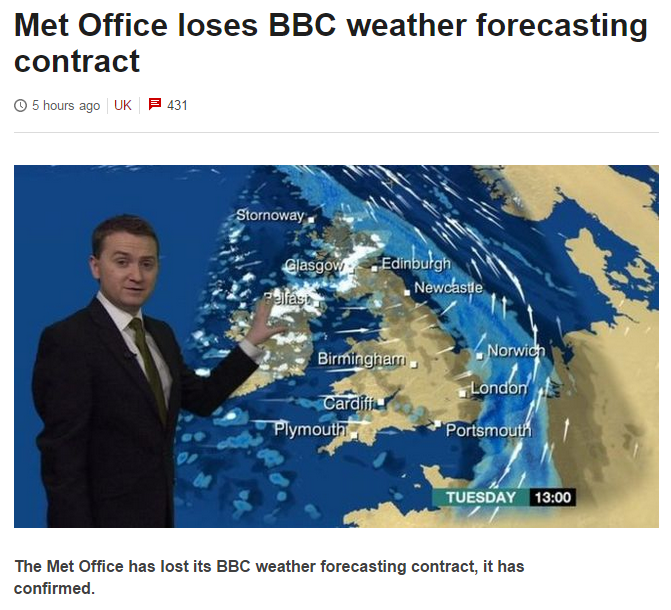 Met office 2013-2014 commercial sales ~ £32M, so less BBC of £30M – £2M, not very much. Is it £30M or £3M, seems some confusion, I suspect £3M is nearer the mark. I choose to believe that they lost this contract because they’ve been darkly ignorant &/or deceptive about sun-climate relations …and that the Talkshop was the venue where the devilish antics were exposed. Of course they would have no problem doing that …implicitly in everything they’ve ever said about sun-climate relations …and I choose to believe that that‘s why they lost the contract! PV: it’s certainly the case that the Met Office has done its reputation harm by endlessly forecasting long-term warming that never arrives. Bad for credibility which must affect commercial success.